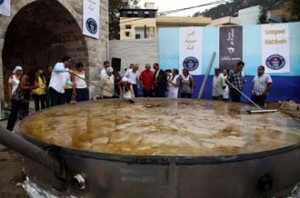 On Saturday August 29th, the Lebanese village of Ehden entered the Guinness World Book of Records for cooking the world’s largest plate of Kibbeh, which is a traditional dish for which Ehden is famous. Kibbeh is a Levantine Arab/Assyrian dish made of burghul and chopped meat. Twenty five women participated in cooking the Kibbe plate, which had an area of 20 square meters and weighed 233 kilograms. They used 120 kilos of mince, 80 litres of olive oil, 80 kilos of cracked wheat, five kilos of salt and a mere kilo of pepper. The event was attended by the Guinness records’ regional representative, Talal Omar, who presented the certificate to Rima Franjieh, the head of the Maydan Institute which organized the festival. Posted: August 30th, 2009 under Cultural, News. Did it taste good? hehe. Grammy would say…wow, wow, wow! nice post that kibbe plate is huge! how many worked on this huge Kibbeh ? Comment from ________ ________ _._.